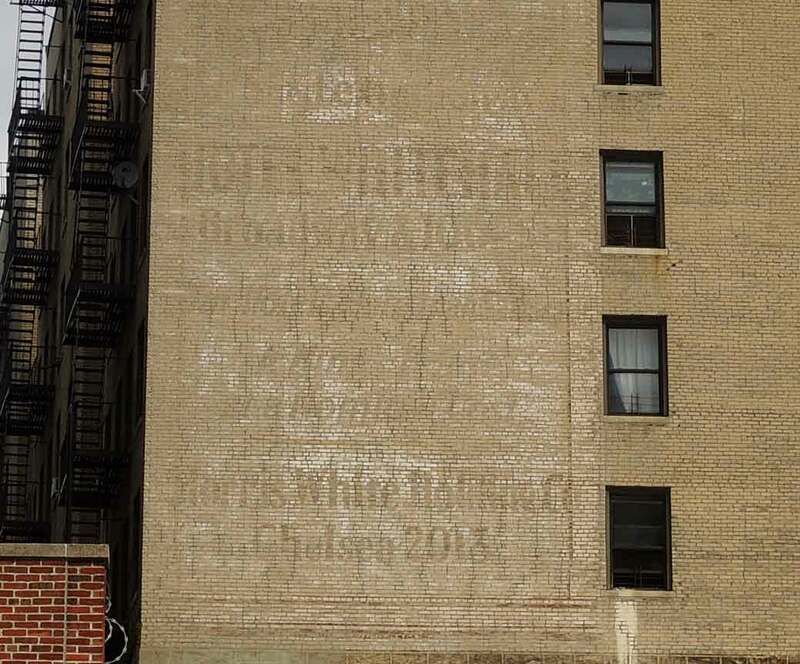 This sign overlooks 158th Street near its west end at the Henry Hudson Parkway, but the hotel advertised was located 58 blocks south at Broadway and 100th St. The same Morris White Holding Co. on the sign and the real estate firm of Morris White Properties were listed at 853 Riverside Drive in the New York telephone directory from 1929 to 1937. Morris White (1888-1962) was originally a dealer in leather goods and manufacturer of handbags, who became involved in the hotel business and real estate investments later. He was also proprietor of the Hotel White at 303 Lexington Ave. and 37th St. The barely discernible Lex above Hotel Whitehall on the sign probably referred to the Hotel White. The Office for Metropolitan History lists four new building permits filed by Morris White between the years 1922 to 1925. These were (1) the Carlton Terrace Hotel, a 14-story brick hotel at 238-252 W. 100th St., in 1922; (2) a 12-story terra cotta apartment hotel, at 305-307 Lexington Ave., in 1924; (3) the White Hotel, a 15-story brick stores and hotel, at 297-303 Lexington Ave., in 1925; and (4) the Fifth Avenue Hotel, a 15-story offices and apartment hotel, at 24 5th Ave., in 1925. The Carlton Terrace Hotel opened in 1923 at 2635 Broadway at the southwest corner of 100th Street. It also included a restaurant called the Carlton Terrace. Entrance to the hotel was at 250 W. 100th St. The following appeared in the New York Times, 11 May 1927, pg. 44, explaining the name change to Hotel Whitehall, "Morris White, owner of the Hotel Carlton Terrace, at Broadway and 100th Street, has announced that the name, management and plan of operation are being changed. He is re-assuming its direction at the termination of a four-year lease. The structure will be known as the Hotel White Hall. Its restaurant will be converted from the smart dining room with dance floor to the more conservative type of dining place." This ad appeared in the Times, 21 May 1927, announcing the opening of the Hotel Whitehall. The Whitehall Hotel remained at 250 W. 100th St. until conversion to apartments in 1981. The building continues to be called the Whitehall in 2015. This photo of the Whitehall canopy was taken in October 2014. In addition to his ventures in hotels and real estate, Morris White was a manufacturer of leather goods and handbags. He began around 1910 when he had a brief partnership with David Marcus as White & Marcus at 97 Crosby St., then on his own as Morris White Leathergoods (1910-1930), Morris White Handbags (1931), Morris White Mfg. Co. (1932-1938), and finally Morris White Fashions, Inc. Morris White Fashions was in business at 362 5th Ave. from 1939 to 1980. Morris White died in 1962, when a detailed obituary appeared in the New York Times, reading, "Morris White, who made and sold handbags off a pushcart and amassed more than $20,000,000 in business and real estate before the Depression of the nineteen-thirties, died yesterday in Doctors Hospital after a brief illness. He was 74 years old and lived at 785 Park Avenue. Mr. White was president of Morris White Fashions, Inc., 362 Fifth Avenue, and of the U.S. Handbag Corporation, 3611 14th Avenue, Brooklyn, whose combined annual gross revenue totals more than $6,000,000. He had erected a large manufacturing plant in Scranton, Pa. The collapse on Dec. 12, 1930, of the Bank of the United States, of which Mr. White was a director, virtually wiped out his fortune, and he filed petitions in bankruptcy, from which he was discharged in 1933. [text missing] had enabled a poor immigrant boy, with little formal schooling, to build a business that was advertised as the largest of its kind in the world, never deserted him. During the nineteen-twenties he built three hotels here - the Fifth Avenue, the White, now the Shelburne and, the Whitehall - and the 35-story Montague Court Building facing Borough Hall Park in Brooklyn. He lost them all but retained his handbag manufacturing business. But he recaptured his penchant for real estate and in 1950 formed the Lillian White Realty and Management Corporation, with his wife as president and himself as treasurer. In June 1953, the corporation purchased the home of the late Harry H. Flagler at 30-34 Park Avenue, where the Rudin Management Company, Inc., built an apartment house. He was born in Kherson, near Odessa, Russia, and came to New York at the age of 12. After 10 days at school he was sent to work. 'I've often regretted that move,' Mr. White remarked in an interview. 'After my father took me out of school, I went to evening school, continuing my studies for some years.' At the peak of his success, he often rejoiced in the title of 'the Henry Ford of Handbags.' He recalled that he had started to work as an errand boy in a handbag factory on the Lower East Side. He then became a bench hand, manufacturing the bags. With $500 he started in business for himself in 1906 in a 'hole in the wall' on Houston Street. He turned out 50-cent handbags, which he peddled from his own pushcart. He was described as a visionary who saw many of his dreams materialize. His business expanded steadily until it was producing 40,000,000 bags a year for this country and 33 foreign countries and employing 1,500 persons with a weekly payroll of $42,000. Mr. White entered the real estate business in the early twenties. His handbag plant then was at 621 Sixth Avenue. In August, 1926, he had two life insurance policies, each for $1,000,000. He became a director of the Bank of the United States, a director of Beth Israel Hospital, and chairman of the endowment fund committee that turned over a $1,000,000 check for the opening of Yeshiva University. By the age of 42, Mr. White had lost many millions in his business and investments. Testifying before a State Banking Department hearing in 1931, he said he owed the Bank of the United States $750,000 and also that he had recruited his 1,400 employes in the bank's drive for depositors. He said he had been unaware that a Banking Department report in 1929 had revealed that the institution was in a precarious condition. In January, 1931, Mr. White filed schedules in bankruptcy listing liabilities of $13,273,681 and assets of $712,000. His assets included $700,000 in life insurance. State and Federal courts approved the sale of his assets to the Morris White Properties Corporation, covering his hotel and other real-estate interests. Mr. White was a member of the advisory board of the National Authority for Ladies Handbags. In 1947 Mayor William O'Dwyer cited him for his contributions to the industry. A man of outspoken candor, he had a reputation for his willingness to lend a helping hand, even to competitors. Surviving are his widow, Mrs. Lillie Brenner White; two daughters, Mrs. Justin Wolf and Mrs. Howard Todman; a son, Bernard B. White; a sister, Mrs. Kitty Epstein; a brother, Abe White, and six grandchildren. A funeral service will be held at 2 P.M., Tuesday at the Park West Memorial Chapel, 115 West 79th Street." A managing director at the Morris White hotels was Oscar Wintrab (1889-1961). His New York Times, 30 May 1961, pg. 17, obituary was considerably shorter than Morris White's, but notes particularly his work at the White hotels, "Oscar Wintrab, managing director since 1953 of the Beacon Hotel, at Broadway and Seventy-fifth Street, died of cancer yesterday in the Harkness Pavilion. He was 71 years old and lived at the hotel. In 1922, Mr. Wintrab was manager of the Nassau Hotel in Long Beach, L. I., and then of the Whitehall, at Broadway and 100th Street. He was in charge of the newly opened Fifth Avenue Hotel in 1927, and was director also of the Whitehall and White Hotels, a chain owned by the Morris White Holding Company. The next year, he was managing director of the Half Moon Hotel in Coney Island, and in 1936 he was named managing director of the Essex House. ... After ten years at the Essex House, Mr. Wintrab became vice president and a director of Spencer-Taylor, Inc., and supervisor of its hotel chain. In 1951, he was elected vice president and managing director of the Abbey Corporation, with offices in the Abbey Hotel. His widow, the former Jeannet Engel, survives."